I'm happy to introduce our newest WWKC Lifetime Pro Member, HaigyoHakushaku! Thank you for your support! Be sure to check out their website Goldolardo Aquatics and their Koiphen Marketplace! 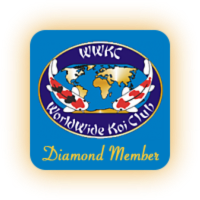 Thank you to crsublette and to Ben at Play It Koi who both renewed their WWKC Annual Memberships! Thank you both for your continued support!